Reviewed from an f&g sent by the publisher. Today we are taking part in Random House's Annie and Helen blog tour. In honor of the September release of Annie and Helen, we will give away one copy of the book to a lucky reader. See contest details and entry form at the bottom of this post. We had the pleasure of interviewing author Deborah Hopkinson about Annie and Helen and her work as an author of children's books. The Nonfiction Detectives: What drew you to the topic of Helen Keller? 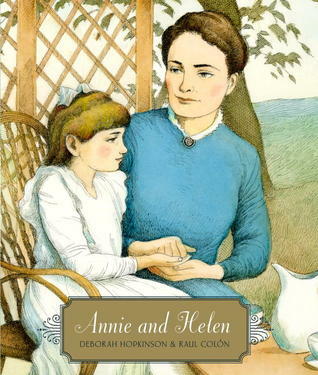 Deborah Hopkinson: Both my kids were fascinated by Helen Keller. Actually, I think many people are, and Keller is listed as one of the most important figures of the 20th century. We admire her courage and accomplishments. After seeing a news article about a long-lost photo of Annie and Helen that was re-discovered in 2008, I decided to research Helen as well as Annie Sullivan. Instantly I became fascinated with how Annie Sullivan, who was only 21 herself invented on her own an innovative way to teach her young charge. Annie and Helen includes excerpts of Annie’s letters during the first four months of her time with Helen. The Nonfiction Detectives: You have written a wide variety of books about history for varied age groups, including nonfiction and historical fiction books for children. Do you prefer writing one genre over the other? If so, why? Deborah Hopkinson: I like writing in a variety of genres. I do find that nonfiction is easier for me, in part because I also have a full time career in philanthropy. Longer fiction is tremendously complex, and harder to incorporate into a busy life with a demanding day job. When I began writing more than 20 years ago I was drawn to picture books because they were short and seemed more practical for a working mom with kids! Overall, I’m happy as long as I am growing and learning as a writer – whether it be picture books such as Annie and Helen, long nonfiction such as Titanic, Voices from the Disaster, or novels such as my forthcoming middle grade historical fiction title: The Great Trouble, A Mystery of London, The Blue Death, and A Boy Called Eel. The Nonfiction Detectives: What was your process for researching this book? Did you read a lot of original documents and travel to Perkins School for the Blind? Deborah Hopkinson: I was in touch with experts from the Perkins School for the Blind, who read the manuscript in advance, though I wasn’t able to travel there. Primarily I consulted the anniversary edition of The Story of My Life by Helen Keller, which includes Annie Sullivan’s 1887 letters to Sophia Hopkins, her friend and former house mother at the Perkins School, as well as David Lash’s excellent biography, Helen and Teacher. As soon as I read Annie’s letters from her first few months with Helen, I knew that was what I wanted to focus the story on. It’s so incredible to think that Annie arrived on March 6 and by July – just four months later, she had mastered enough skills to write a letter. That says a lot about both the pupil and the teacher. 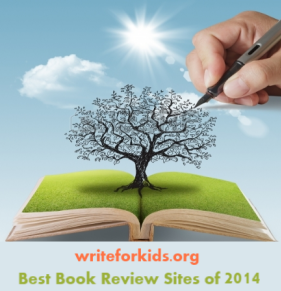 The Nonfiction Detectives: Did you always want to be a writer? Deborah Hopkinson: Yes, I think I’ve wanted to be a writer since I was about ten years old, but it wasn’t until after my daughter was born that I began writing for children. We would go to the library and check out picture books and I thought that maybe this was something that I as a working mom could do. My first book was published in 1993. The Nonfiction Detectives: You collaborated with Raul Colon on A Band of Angels. Did you imagine Raul Colon as the illustrator while you were writing Annie and Helen? Deborah Hopkinson: I don’t usually think about who the illustrator might be when I’m working on a manuscript. Most of the time, the editor chooses and illustrator once my part is done. I love Raul’s work on A Band of Angels and am delighted to be paired with him again. Recently we were at the same conference and he shared that for Annie and Helen he took his inspiration from the paintings of Mary Cassatt. You can certainly see how he creates that sense of a warm, loving relationship between Annie Sullivan and Helen Keller that is reminiscent of Cassatt’s portraits. The Nonfiction Detectives: What is your writing schedule like? Do you write every morning? Do you have a studio? Deborah Hopkinson: I have always combined writing with my day job, which means I don’t write every day. Presently I am vice president for advancement at Pacific Northwest College of Art in Portland, Oregon. Sometimes I take a vacation day to meet a writing deadline; most often I write on weekends. As far as where I write, I have two favorite spots. One is at the kitchen table; the other is sitting on my bed with my laptop and a portable ironing board. I can look out the window, which is on the second floor. I find this very relaxing, perhaps because I am in an office all week sitting at a computer. And, of course, I usually have a dog stretched out next to me for company! The Nonfiction Detectives: What do you hope readers take away from Annie and Helen? Deborah Hopkinson: Well, I hope readers come away with a deeper appreciation of Helen Keller’s amazing drive to learn, something that she was committed to throughout her long and productive life. I also hope readers will go beyond the famous scene at the water pump and be able to really see how inventive and dedicated Annie Sullivan was as a teacher. It’s inspiring to think that this young woman, who had faced so much adversity herself, was able to accomplish in these early months with Helen, when she herself was only just 21. Entries will be accepted from September 7, 2012 until 11:59 p.m. on September 11, 2012.